Season Seats are in great demand. That's why the Oilers created the Season Seat Registry - a fair way to ensure those who want Season Seats get them when they become available. Now is your opportunity to reserve your place on the roster for the purchase of Oilers Season Seats at Rogers Place. By registering for the Edmonton Oilers Season Seat Registry, you will be eligible to purchase Season Seats as they become available. If you are interested in Chairman's Club, Scotiabank Suites, Theatre Boxes or PCL Loge Tables or Ledge seats, please visit our Premium Seat Registries Page. For more information on Oilers Season Seats at Rogers Place, including 3D views and pricing, please see our interactive map. Please note that desired seats may not become available through the Season Seat Registry process and are often only achieved once you become a Season Seat Holder through our annual relocation process. A one-time Registration Fee of $210 per account is required to join the Season Seat Registry. The registration fee is refundable and will be applied towards your future purchase of Season Seats. A non-refundable Administration Fee of $75 per account is required annually, which is due upon joining the Season Seat Registry and is not applied against future purchases. If you decline to pay the administration fee in any year, you will automatically be removed from the Season Seat Registry. You will receive a priority number indicating your priority position on the Season Seat Registry. When Season Seats in Rogers Place become available to purchase, members will be given specific times online to make their seat selections. Members may decline seats if the selection does not meet their criteria and still retain their priority rank on the list. Your position on the Season Seat Registry is non-transferable, other than within your immediate family. Thanks to fan support throughout Oil Country, Oilers Season Seats are over-subscribed. The Oilers Season Seat Registry has been created to provide an organized and fair process for fans to have access to Oilers Season Seats at Rogers Place should they become available. Please click on the link that applies to you and have your credit card on-hand. An initial $210 Registration Fee will be charged per account and applied to any future Season Seat purchases (not applicable to existing Oilers Season Seat Holders). Additionally, a $75 Administration Fee will be charged per account annually. Is there a limit to the number of seats I may purchase? You do not need to decide upon the number of seats you wish to purchase at this time. This decision may be made once given the opportunity to purchase seats. However, the current maximum number of seats permitted to each Season Seat Registry account is four seats. A $200 one-time Registration Fee is charged upon initial registration to join the list. This fee is applied to your Season Seats when you exercise your opportunity to purchase. The Registration Fee is refundable at any time. The Registration Fee is waived for existing Season Seat Holders wishing to purchase additional seats. A $75 Administration Fee is assessed annually on active accounts to ensure continued interest and to provide customer service to Season Seat Registry members. Why do I have to pay to get on the list? The fees are required to confirm the interest that members have in purchasing Season Seats at Rogers Place. The Registration Fee also acts as an initial installment towards the Season Seats. How long will it take to get Season Seats? 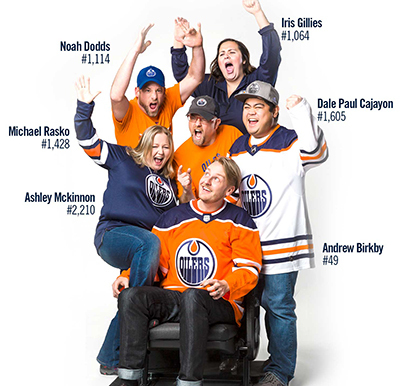 The number of Season Seats that become available to Season Seat Registry members annually will of course depend upon the rate at which current Oilers Season Seat Holders renew as well as the number of Season Seat Registry members purchase ahead of you. Although we cannot tell you how long it will take to receive access to seats, we can keep you informed of your progress through the Season Seat Registry. Can I remove my name from the list? You can remove your name from the Season Seat Registry at any time and receive a full refund on your Registration Fee. All Administration Fees are non-refundable. Can I transfer my Season Seat Registry priority position to someone else? Your position on the Season Seat Registry can only be transferred to members of your immediate family. What if I am offered seats that I do not want? You may decline the seats offered and retain your priority ranking on the Season Seat Registry. However, please know that desired seats may not become available through the Season Seat Registry process and are often only achieved once you become a Season Seat Holder through our annual seat relocation process. Is there a limit to how many times I can sign up to the Registry? A person/company/account is permitted one (1) Registry spot at a time. Once you are successful in purchasing Season Seats, you can sign up for the Registry again and rejoin the list. Anyone found attempting to circumvent this limit will have their Registry positions cancelled without notice.